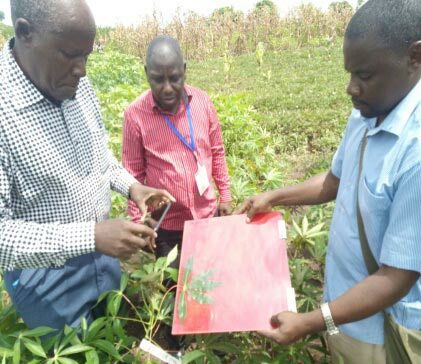 The African Cassava Agronomy Initiative (ACAI) project has trained its staff and partners on agronomy database management and the barcode labeling system. 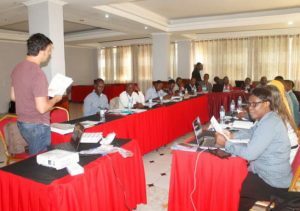 The training was necessary due to the increased number of field trials the project is conducting in the country, and which in turn has created the need to clearly label and identify each attribute being studied. The training was held in Mwanza, Tanzania, from 27 February to 10 March. The training aimed to make the 21 participants (16 males and 5 females) understand database management including adding data to the ACAI-database platform through mobile or web-based tools and how to assign “entity identifiers” through barcode labeling. A hands-on training on how to use the new open data kit (ODK) tool forms for data collection in ACAI activities was also conducted. In previous agronomy trials, data were collected using both field books and ODK forms, which was tedious and time consuming. Also, the collected data were easily mixed up or duplicated because there was no clear assigned unique identity (label with the barcode) of the field, trial, plots, treatment, and plants. By the end of the training the participants were able to assign the unique entity identifiers of the fields, trials, treatments, plots, and plants and trace them back during data collection. This technique will assure good data management, simplify data collection, and reduce the possibility of missing data. The ACAI project is seeking to address major constraints of cassava production in Tanzania—poor agronomic practices and low soil fertility. These constraints have contributed greatly to the reduced production of cassava in the country to levels of <5 t/ha, compared to the previous yields of 10 t/ha. If these constraints are not addressed timely and appropriately, this may soon lead to further cassava yield reduction.